The FDIC has released their quarterly banking profile. Over the weekend a Spanish bank, Cajasur, was seized. This is a large Spanish bank with $23.9 billion or 0.6% of Spain's assets. A dysfunctional labor market, the deflating property bubble, a large fiscal deficit, heavy private sector and external indebtedness, anemic productivity growth, weak competitiveness, and a banking sector with pockets of weakness. Ambitious fiscal consolidation is underway, recently reinforced and front-loaded. This needs to be complemented with growth-enhancing structural reforms, building on the progress made on product markets and the housing sector, especially overhauling the labor market. A bold pension reform, along the lines proposed by the government, should be quickly adopted. Consolidation and reform of the banking system needs to be accelerated. The EU is also calling for Spain to modify it's pension system by raising the retirement age and scaling the benefits. The IMF is zeroing in on Spain's labor markets. So why exactly are they doing this and why are workers supposed to be stuck with the housing bubble and derivatives bill as sovereign nations become mired in debt? BankUnited, a newly chartered federal savings bank, acquired the banking operations, including all of the nonbrokered deposits, of BankUnited, FSB, Coral Gables, Florida, in a transaction facilitated by the Federal Deposit Insurance Corporation (FDIC). As a result of this transaction, BankUnited, FSB, offices and branches will be operated as BankUnited offices and branches. BankUnited's 86 offices will be open tomorrow during normal business hours. BankUnited, the successor institution, will be the largest independent bank in Florida, as was its predecessor (BankUnited, FSB). The management team is headed by John Kanas, a veteran of the banking industry and former head of North Fork Bank. This time it was three banks and two credit unions. I guess they were making up for a couple quite weeks. I find it disturbing that the credit union system is getting unstable with almost no reporting. The pace of the ongoing credit crisis quickened significantly Friday when regulators seized three banks and placed two large corporate credit unions into conservatorship, citing a need to "stabilize the corporate credit union system." Once again, Joseph Stiglitz is offering his considerable opinion as to what needs to be done in tackling our financial crises. His current article at The Nation is both rational and sensible. Read it here and see how relatively simple his solution is. Of course, the bank lobby won't like it. Senate Banking Committee Chairman Christopher Dodd is moving to allow the Federal Deposit Insurance Corp. to temporarily borrow as much as $500 billion from the Treasury Department. The Connecticut Democrat's effort -- which comes in response to urging from FDIC Chairman Sheila Bair, Federal Reserve Chairman Ben Bernanke and Treasury Secretary Timothy Geithner -- would give the FDIC access to more money to rebuild its fund that insures consumers' deposits, which have been hard hit by a string of bank failures. Why is this significant? At minimum the FDIC is preparing for a lot more bank failures. 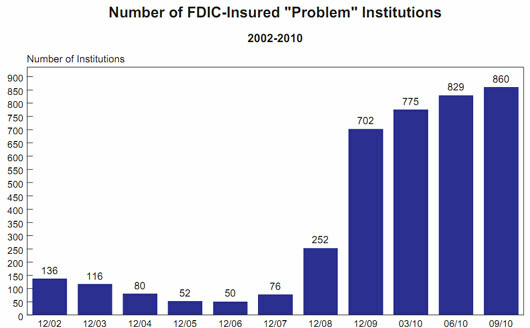 Currently the loan limit is $30 Billion and the FDIC is primarily funded by fees paid by banks. Instead of Friday Movie Night blog series on the The Economic Populist perhaps we should have a series, All the News They Do Not Want Read. Everyone notice the most interesting, alarming and slight of hand Press releases are on Friday, 5pm EST or later?